If you’ve been waiting to play Orphea, now you can — she’s live in the Nexus right now, and brings a new flavor to the mid-range Assassin role. Her unusual shadow-based powers make her a distinctive character to play in the game, and they also play into this latest Heroes of the Storm comic. It deals with Orphea’s history, her connection to the Raven Lord, and how the events of the previous comics have caused Orphea to decide to deal with the threat of the Dark Nexus as a hero. 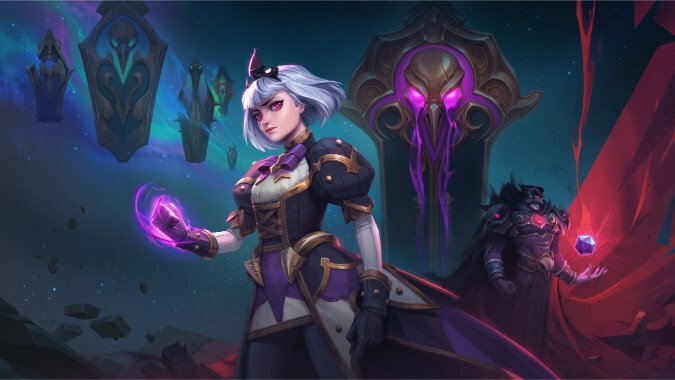 If you haven’t tried Orphea yet, she has a creepy shadowy vibe conjuring up dark minions to consume her enemies — think a mix between Raven from the Teen Titans and Jackie Estacado from The Darkness. Her Shadow Waltz ability in particular means that she’s dependent on a somewhat aggressive combat style. What’s interesting to me about the Orphea comic is that, as the fourth in the series of Heroes of the Storm comics, it finally really develops the lore of the game in an interesting direction — heck, it picks a direction, which feels almost ground breaking. The story is finally starting to cohere around Orphea in a way that it didn’t, really couldn’t around the Raven Lord or the Lady of Thorns because unlike them, she’s a playable character. She’s not just a protagonist, she’s someone we can identify with because she’s someone we can essentially personify, and her actions in opposing her father and his plans make her feel more grounded. Plus, there’s quite a bit of mystery surrounding her yet — the fate of her mother, for example. Also, to celebrate Orphea’s debut, you can link up your Twitch account and get some Heroes of the Storm Orphea-themed goodness. How? By following this link and obeying its shadowy directions. Okay, they’re not that shadowy. It’s pretty straightforward, really — create a Twitch.tv account and link it to your Blizzard account and viola, fabulous prizes await you. You can get a Chomp emoji pack, a baby Chomp portrait, or a Chomp spray all hearkening to Orphea’s penchant for summoning a shadowy entity to, yes, Chomp her foes. So yeah, you can go call up creatures of night-dark shadow to eat your enemies and get some neat Twitch stuff for it, plus read a cool comic about her, all right now.